This novel was inspired by my travels up into the hill stations of Matheran, Lonavala and Khandala. Satapur is a fictional land that is part of the Kolhapur Agency, an actual group of princely states in Western India that were under British surveillance until independence in 1947. Here’s an excerpt to give you a taste of where Perveen is headed. 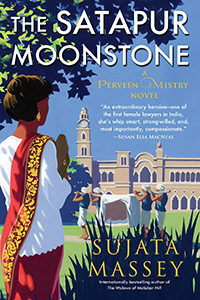 The Satapur Moonstone can be purchased in stores and libraries on May 14. However, if you pre-order it now at a local bookstore or online retailer, that helps me more than you’ll ever know. It also means you get the book in your hands on the 14th—no waiting in case it goes out-of-stock. You can pre-order the US and World English Soho Press edition of The Satapur Moonstone at your local bookshop or with an online retailer. South Asia residents, please preorder the Penguin Random House India edition! Here’s an upcoming event that is perfect for pre-ordering friends. The Satapur Moonstone Book Club on Facebook Live is gathering at my author page on Facebook thirteen lucky days after publication. We will discuss everything—research, characters, ending—of The Satapur Moonstone at 8 PM EST on Monday, May 27 (Memorial Day evening) in a video conference. This means you can see me relaxing my living room with my dogs—and use the sidebar feature on your computer screen to send me questions which I’ll read aloud and answer. You will not be seen, but your questions will be heard loud and clear. If you are outside the US or Canada, please check if the time difference might allow you to join us, because you will be a VIP participant! The best way to remember this event is to sign up as “GOING” on the event page, and Facebook will remind you. Subscribe to Sujata’s email list and receive a free Perveen Mistry story! Receive "Outnumbered at Oxford," a prequel to The Widows of Malabar Hill, plus exclusive content, book news, contests, and more! Sujata blogs at Murder Is Everywhere along with other renowned crime writers from different corners of the world. Read her posts every other Wednesday!